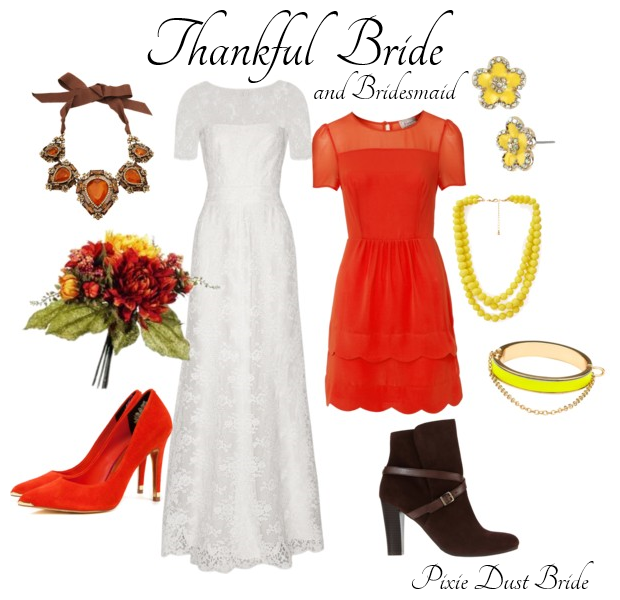 This style board for the Thankful Bride and Bridesmaid was obviously inspired by the colors of fall and Thanksgiving. I used a “pumpkin pie” orange as a base color with brown and yellow as accent colors. I love the orange bridesmaid dress with the brown booties but the orange pumps would work, too! And the pretty yellow accessories would look great on either the bride or bridesmaid; same with the amber necklace. Pixie Dust Bride wishes you and your loved ones a Happy Thanksgiving! Take a day to count your many blessings and enjoy the world around you. See you next week!